There is no reason to go out and pay for an expensive gym membership or buy your own exercise equipment to get in shape, you most likely have the only piece of equipment you will need already tucked away under your bed. Whether you have an exercise or yoga mat at home, these are all you need to get yourself back on the fast track to optimal health. That being said, to get yourself in peak condition you are going to need some motivation, a little persistence, and of course those exercise mats. For many people, they cringe at the idea of getting down and doing push-ups. The reason for the apprehension is because at one time you were asked to get down and give somebody 20, and by the 5th push-up, your arms, legs, and core were on fire. That memory is simply stuck in your subconscious and keeping you from building up your muscles and endurance. The key here is patience and persistence. What if you were doing 60 push-ups a day one month from now, how do you think your body would look? It’s easy. Place the exercise mats somewhere where you have plenty of room, turn up the music, and do this when there will be the least amount of distraction. Get on the mat, legs straight, core straight from ankles to shoulders, and do 2 push-ups, pause 10 seconds, then do 2 more, then pause 10 seconds, do 2 more. That’s it. You did 6 push-ups for today, Great job! Now tomorrow do 3 sets of 3, then the next day 4, 5, and so on. By day 30 you will be crushing those push-ups. Imagine in your mind the effort it would take to walk up the side of a mountain in several feet of snow. Each step takes tremendous effort, and you slowly make your way to the summit one step at a time. This is exactly how you must approach the mountain climber workout, except you will be in the comfort of your home standing on the exercise mat. To begin this workout, stand up with your legs straight and your core tight. Now bring one of your legs forward, all the way, until your thigh is touching your chest. Hold one second, then lower your leg as you bring the other leg all the way up to your chest and hold. Once you get the motion, you can speed up the repetitions to the point you are doing between 40 – 50 each rep. Like the push-ups, start small on day one but promise to commit to increasing the number each day for 30 days and them marvel and your body. If you are looking to increase your muscle tone in your legs while getting rid of that spare tire around your stomach, the full-body squats are in order. By keeping up with these movements for a month, two things will happen, fat will begin to melt away and you will build up a tolerance for exercise, so it will get easier for you to be motivated. Start the full-body squat standing straight up with feet shoulder width apart. Place your arms straight out in front of you, then slowly lower your body until you are in a seated or squatted position. Make sure the back remains straight, hold until the quads become parallel with the ground, then slowly raise up to starting position. The key here is slow steady movements. Continue for 20 reps or until you feel that burn. Tomorrow increase the number, and again for the next 30 days. Each day you build up resistance and feel less pain. Although planking has been in the spotlight for the better part of this year because of all the unique places people are making this unique pose, it does actually help to strengthen your core and tone your muscles too. Planking is simple in concept, but you will certainly feel the burn after a minute. Get down on the exercise mats and support your weight only with toes and forearms. While in this position, it is important to pull up your belly towards your spine to get maximum results. Once you feel that aching in your abs, you know the planking is working. Today commit to 30 seconds, three reps. Tomorrow try for a full minute and increase the time 30 seconds each day. By months end you are going to have a solid foundation without the need to hit the gym again. When most people hear the words sit-ups, they immediately feel the pain in their necks and stomach and resort to making excuses why they can not exercise. 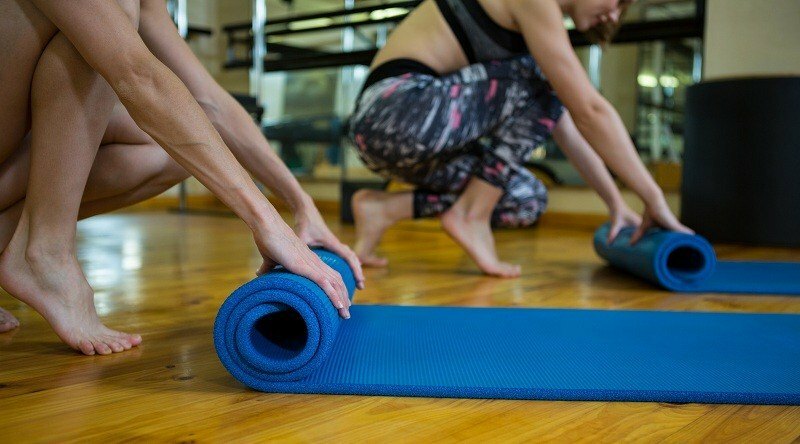 This fitness workout on your exercise mats is called the full body roll-up, and it is a simpler version of the sit-ups that will have amazing results in your body. To begin, lay down on your back, stretch your arms above the head and on the mat so you are one big straight line from toes to fingers. Now begin with a deep breath, then slowly begin rolling upwards by lifting your arms first and following with your core until you are in the seated position with your hands and arms high above your head. Hold, exhale, then slowly begin lowering yourself down back until you are flat again on the exercise mat. Take your time, the key is to do this as painlessly as possible, and building up your resistance each session. Do this three times, pause, three more, pause, three more. Each day add one more and in a month you will be able to do 100 with ease. These five fat burning fitness workouts on exercise mats are designed to build up muscle, increase metabolism, and keep those pesky fat cells from depositing in your body. In a month you will have conditioned yourself to be a lean-mean sculpted machine. The hardest part is giving up on those excuses why you can’t, and just tell yourself that nothing can stop you from your journey to optimal fitness and well-being. Each of these simple aerobic exercises will also help strength the most important muscle in your body, the heart. Physicians say that 20 minutes of aerobic exercise three times a week can have a long-lasting positive impact on your heart health. Just think, all you need is those exercise mats, some determination, and a little push, and this time next month you will look and feel like a brand new you. Photo from: Wavebreakmedia / depositphotos.com.